Vera Bradley's famous quilted handbags may be a bit mumsy, but her funky flip flops are a good reason to give this American designer another chance. Vera has stamped her inimitable style on these beach shoes, but it doesn't look quite as dated here. The red rubber soles make the monochrome black and white daisy design really pop. Most designers decorate their flip flop soles, but few remember that this effort is wasted when we're wearing the shoes. Vera Bradley goes that extra step by adding a few tiny flowers along the strap. It's such a simple touch, but it gives these flip flops some real flair. I'm taken by the design on an aesthetic level, but my more sensible side makes me pause. The use of rubber will make these flip flops hardy, but those straps aren't likely to be very comfortably. That's especially true if you have wet or sensitive sunburned feet, as the material will drag against your skin. These are certainly flip flops that care more about fashion than our feet. For a mere $24 I don't mind that sacrifice though. They look very cute, and in short spurts they'll be comfortable enough. I wouldn't wear them on long beach walks or games of beach volleyball, but they'll certainly suit the needs of most beach-loving women. 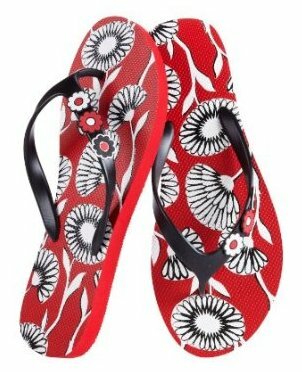 The Vera Bradley English Meadow flip flops are a good alternative to these floral flip flops.